If you are using iPhone you can set LED flash for alerts so that it will blink for incoming calls, text etc. (You can enable or disable LED Flash for Alerts under Hearing aid section on settings => General => Accessibility). Android does not have this feature but you can install an application to het this feature on your android Phones. Flash Alerts is a Free application from MegaWave Software which supports this. The pro version of this software Flash Alerts Pro is free now which was $2.99 earlier. The pro application supports additional features such as Do Not Disturb (DND). You can set a start and end time for DND. The pro version also supports status bar notification alert. 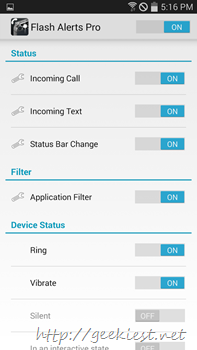 You can turn ON/OFF the feature over the device's status. (Ring, Vibrate, Silent, In an interactive state).